T-50A trainer is being offered for the USAF T-X trainer programme. Image courtesy of Lockheed Martin Corporation. T-50A is an advanced version of the T-50 trainer aircraft. Image courtesy of Lockheed Martin Corporation. The first T-50A trainer made its first flight in June 2016. Image courtesy of Korea Aerospace Industries, LTD. The T-50A prototype made its public appearance in December 2015. Lockheed Martin and KAI successfully conducted the maiden test flight of the first T-50A aircraft in June 2016. The second T-50A configured aircraft completed its first flight at Sacheon airfield in South Korea, in July 2016. 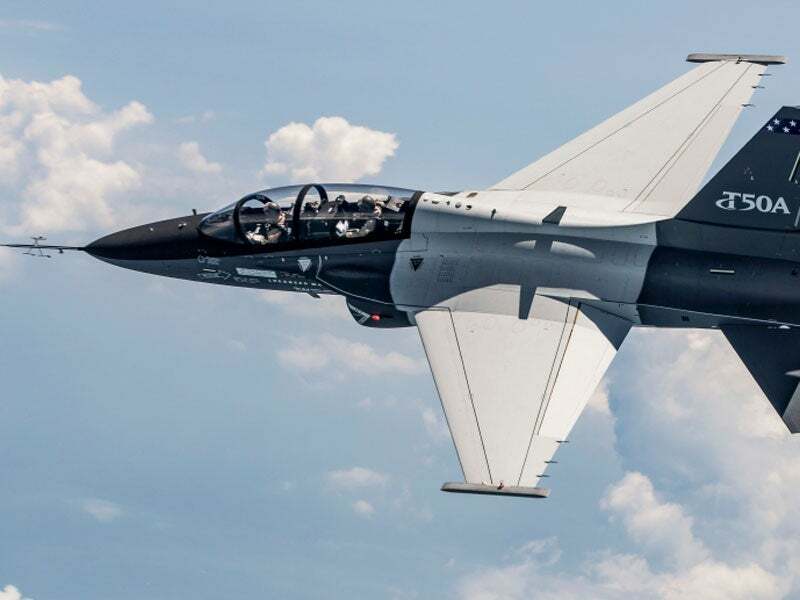 Lockheed Martin opened a new ground-based training facility in Greenville, South Carolina, in August 2016, for the T-50A trainer and ground-based training system. The facility houses production equipment and systems to perform final assembly and flight operations of the T-50A trainer aircraft. The APT programme is intended to replace the ageing T-38 Talon jet trainers. The USAF plans to sign a contract for the acquisition of 350 T-Xs to replace the 431 T-38s. The USAF intends to issue a request for proposal for the T-X programme in December 2016. The new T-X trainer is anticipated to achieve initial operational capability by 2024. Other contenders for the T-X programme include the Boeing / Saab team, and Northrop Grumman, which are offering new designs for the T-X requirements, and the Raytheon / Leonardo team, who are proposing a mature aircraft design for the competition. The T-50A features a blended wing-fuselage with horizontal and vertical stabilisers. It is purpose-built to meet the training requirements of fifth-generation fighters such as F-22 Raptor and F-35 Lightning II. The under-fuselage incorporates a retractable tricycle-type landing gear. The T-50A is designed to offer fighter-like performance and characteristics to eliminate pilot training gaps between the current trainer fleet and fifth-generation fighters. The T-50A trainer integrates a modern, full-glass cockpit housing an instructor and a student in tandem seating layout. Each seat can accommodate personnel weighing between 53kg and 99kg. "The T-50A is designed to offer fighter-like performance and characteristics to eliminate pilot training gaps between the current trainer fleet and fifth-generation fighters." The anthropometrically designed, fifth-generation cockpit integrates a large-screen display, digital flight controls / fly-by-wire, and next-generation air traffic management systems. It is also equipped with an onboard oxygen generating system and an environmental control system. The T-50A is an easy-to-fly aircraft such as the F-16, F-22 and F-35 fighters. Its resemblance with other fifth-generation aircraft eliminates negative training and unneeded operational flights, resulting in faster and more cost-effective training missions that enable student pilots to concentrate on their aviation skills. The ground-based training system (GBTS) comprises a range of innovative technologies to provide options for transferring aircraft training tasks into the simulation. The system implements cutting-edge technologies based on the lessons learned from decades of training with evolving technologies. The synchronised GBTS from Lockheed Martin also maximises training effectiveness, while minimising costs. It prepares the next-generation of pilots to operate next-generation aircraft. The T-50A is powered by a single General Electric F404 turbofan engine equipped with full-authority digital engine control (FADEC) system. The power-plant integrates three-staged fans, seven-stage axial arrangement and an afterburner. The T-50A has the ability to fly at a supersonic speed of Mach 1.5 and can attain a range of more than 1,850km.